Interfacial fluid mechanics, such as the dynamics of drops and bubbles, are important to problems in a variety of fields. For example, the dynamics of drops of complex fluids are important in ink-jet printing and Bloodstain Pattern Analysis; whereas the aerosols formed from bursting bubbles over the ocean can transport pathogens and cloud-condensation nuclei into the atmosphere. In this talk, I focus on the impact of drops on highly non-wetting solids, such as superhydrophobic surfaces. Upon impact on these surfaces, a drop will spread and retract so quickly that it can completely leave the surface. By modifying the surface structure at a variety of scales, the shape of the drop during the bounce can be adjusted, impacting the contact time and surface interaction. I will show high-speed movies to highlight the phenomena, and I will discuss how experiments and mathematical modeling have given us insight into the underlying physics. 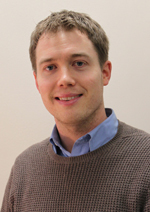 James Bird is an Assistant Professor in the Mechanical Engineering Department at Boston University. He received his B.S. from Brown University and his Ph.D. from Harvard University, after which he completed an NSF Mathematical Science Postdoctoral Fellowship at MIT. His research focuses on interfacial fluid dynamics with an emphasis on the dynamics of drops and bubbles. He is the recipient of a Fulbright Fellowship (2004), an NSF CAREER award (2014), and an ONR YIP award (2016).